After years of dealing with mysterious symptoms, Nicole Rickert was diagnosed with Ehlers-Danlos syndrome. Now she's working with her team at Mayo Clinic to get the care she needs to move forward into a healthy future. Nicole Rickert was only 13, and an active member of her junior high drill and dance teams in Dallas, when it became painfully evident that something was wrong. "My back was hurting all the time, and I couldn't stand up straight," she says. That limitation made her a "bad dancer," she laments. 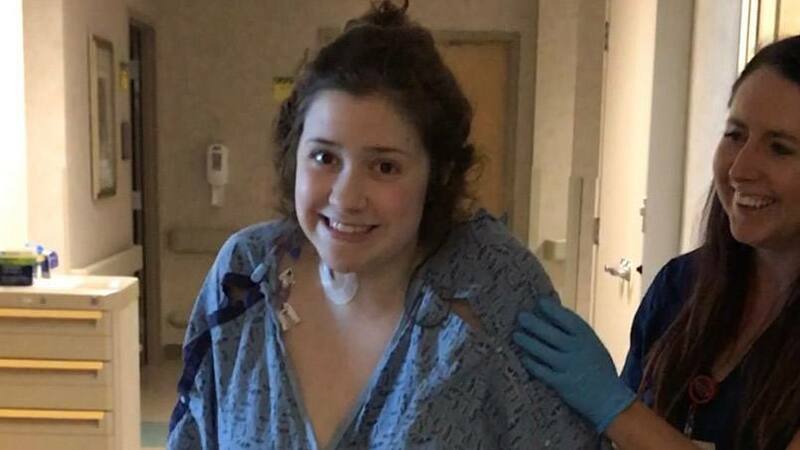 But it was just a hint of the complicated health journey Nicole would endure that began with a diagnosis of scoliosis and escalated to include more health issues that would put her young life on hold. After enduring years of symptoms her health care providers couldn't explain, Nicole, who is now 19, took charge of the situation and began searching for answers on her own. She was convinced she had found the source of her problems when she discovered information about Ehlers-Danlos syndrome — a connective tissue disorder that can trigger a host of medical problems. She was right. Diagnosed with Ehlers-Danlos, Nicole went to Mayo Clinic to receive care and learn more about her condition. Although she still has more treatment to come, Nicole is optimistic about the prospect of a positive outcome. "My surgeons have really high hopes for me, and I'm young," she says. "I think I'll be successful, and I'll get a new lease on life." When Nicole started having back pain, she assumed a solution was within her control. "Everyone told me my back muscles were weak, and that I needed to do exercises," she says. So Nicole dutifully complied, pulling and stretching to work the bands on her exercise equipment. But instead of being rewarded with pain relief, she found that her wrists would dislocate. She questioned whether that reaction was normal. "I assumed it was kind of weird," Nicole recalls. "But I thought that maybe I was just flexible." By her sophomore year in high school, she was fitted for a back brace to treat her scoliosis. Hot baths provided a brief respite from the pain. But just getting out of the tub caused her hips to "sort of fall," as she describes it. The condition affected her fingers as well, making it hard to turn a doorknob. Pain of another kind also plagued Nicole — her disappointment in not being able to fit in at school. "High school kids can be mean," she says. "They didn't understand. I hurt all the time and didn't want to go out and do things." Still, Nicole excelled in academics, earning top grades and doing well in high school. Yet she almost missed her graduation because she was hospitalized. Although she was discharged in time, she still faced the issue of "trying to walk across the stage," she says. But with full resolve, she made that milestone walk and, she proudly announces, she did so in her "favorite high heels." Nicole then headed to college in Alabama to fulfill her dream of entering a pre-med program and then qualifying for medical school. But that dream was placed on hold when the painful symptoms returned. Nicole had to withdraw for the semester. So began Nicole and her family's determined search for a diagnosis — one that acknowledged her scoliosis, but then went beyond that to reveal the root cause of her other symptoms. In addition to back pain, Nicole experienced heart issues, where her heart rate would accelerate abnormally. She especially questioned why the curve in her back wouldn't straighten out even though she wore her brace 23 hours a day. A local search in Dallas was disappointing. Nicole was told by one health care provider, "You've stopped growing. Your scoliosis isn't getting worse, so go have a great life." Another told her that she was so flexible, "she could be in the circus." Nicole's mom, Phyllis, however, was with her all the way. "I'd get on the phone and call all these orthopedic places," she says. "I'd explain all her symptoms, and they would have no idea what I was talking about." But Phyllis knew her daughter and understood that she was too curious, too smart and too determined to not figure it out. And that's exactly what Nicole did. She refused to give up, continuing to research her symptoms in hopes that something would reveal the answer. "I stayed up all night, reading research articles," Nicole says. "And I ran across Ehlers-Danlos syndrome, a connective tissue disorder." She immediately announced to her family that she had nailed it. She was convinced it was Ehlers-Danlos that caused her the pain and anguish all those years. Because Phyllis had arranged an appointment for Nicole with a new orthopedic specialist in Texas, Nicole quickly showed the physician the article that she felt confirmed her own diagnosis. To her relief, he told her she was right. It was Ehlers-Danlos syndrome. It was an emotional day for Nicole. "I was like, 'So I'm not crazy!'" she says. "Now I know it's real. Now I have my answer." As comforting as it was to finally have a diagnosis, Nicole was still sad for what she had lost due to her condition over the years. "I kind of mourn that person I used to be, where I could go out for hours and shop," she says. "I turned into the person who had to sit on the shelves at a store, because I would be too tired to stand up." Despite that, Nicole was prepared to move forward and ready for the next chapter. Ehlers-Danlos is an inherited disorder, so Nicole was interested in learning more about her genetic makeup. When Nicole heard about physician Radhika Dhamija, M.B.B.S., at the Mayo Clinic's Arizona campus, she and her family were ready to make the journey. Dr. Dhamija, who heads the Clinical Genomics Clinic that opened in January 2017, says Ehlers-Danlos syndrome is common in the field of genetics and is seen frequently at the clinic. When Dr. Dhamija saw Nicole, she confirmed the teen was at the "extreme end of the spectrum, having hypermobility," where joints move beyond the normal range. She also said that Nicole's severe scoliosis hadn't been properly addressed, and she referred Nicole for surgery. "Unfortunately we still don't know the gene that causes the hypermobility type of Ehlers-Danlos syndrome that Nicole has," Dr. Dhamija says. Nicole admits it was scary to leave Dallas and travel all the way to Phoenix, not knowing what to expect. But she takes comfort in the skill and compassion of Dr. Dhamija, and the relationship she has formed with her genomics nurse coordinator, Mary Madden. "We wish we would have come here sooner," Nicole's mother, Phyllis, says. "We were treated like royalty, and we can only go up from here." Learn more about the Department of Clinical Genomics. Nicole I’m so happy to hear that you were able to get diagnosed and found a great Dr. to help you. I’m sorry it took you so long and sorry you have had to go through so much. I have been trying to find help for my 14 year old grandson who suffers from dislocated ribs that will not stay in place. The many Dr.’s we have seen either never heard of such a thing or told us that ribs don’t dislocate. @deb1941 My daughter has the same problem with the ribs and has been told that it's called "Slipping Rib Syndrome" which goes along with the Ehlers Danlos. She has been doing PT to work on her posture 3 days a week and shockingly it has helped. Her Dr has also recommended her seeing a CT surgeon to possibly have a rib "pinned" (I have yet to go down that road). Best of luck to you! Nicole love your story and understand the obstacle course you've been through and most likely continue to navigate. My granddaughter Emily went through the same thing beginning in 2010 her first day of high school. Her "course" is EDS + Chiari Malformation + POTS + Mast Cell Disorder + Dystonias + CSF shunts + co-morbidities et al. She and her mother advocate, educate, and investigate. She's finally had a few weeks of "normalcy" and made a trip on her own first time flying NC to FL. Because of the EDS she has a port-a-cath to help access blood draws. They have been working for several weeks to find in Central and NE FL Home Health to help with this if necessary and can't find that help. So instead of an enjoyable vacation for her to visit her family & friends she's spending her time trying to locate this specialized help. <sigh> the fight continues.